I have turned down many opportunities to review and give away books these days as I have had my hands full with pregnancy and my two year old. 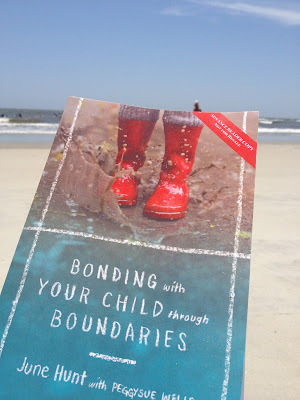 However, when I was contacted about reviewing the book Bonding With Your Child Through Boundaries, the title caught my attention. Boundaries are something that two year old's like to test, and fully aware of my shortcomings as a mother, I knew that I could use some encouragement and Biblical insight in the area of boundaries! I constantly question if I'm doing this parenting thing right, knowing full well that there is not necessarily a "right" way and in spite of my best efforts, I will make mistakes in raising my children. However, I do know that there is a Biblical way to parent and I love reading what godly men and women who have been through this parenting journey have to say about training children. And that's how I found myself reading Bonding With Your Child Through Boundaries by June Hunt and PeggySue Wells. I brought the book to our beach vacation with me having this fantasy that I was going to read it on the beach. Ha. Realistically, I took a picture of the cover of the book, read the first page and then played with my 2 year old in the sand and waves for the remainder of the time. No regrets. So since then, I have spent a few nap times and evenings working my way through this book and am excited to share my thoughts on it as well as offer you a chance to win your own FREE copy of Hunt's book at the end of this post! 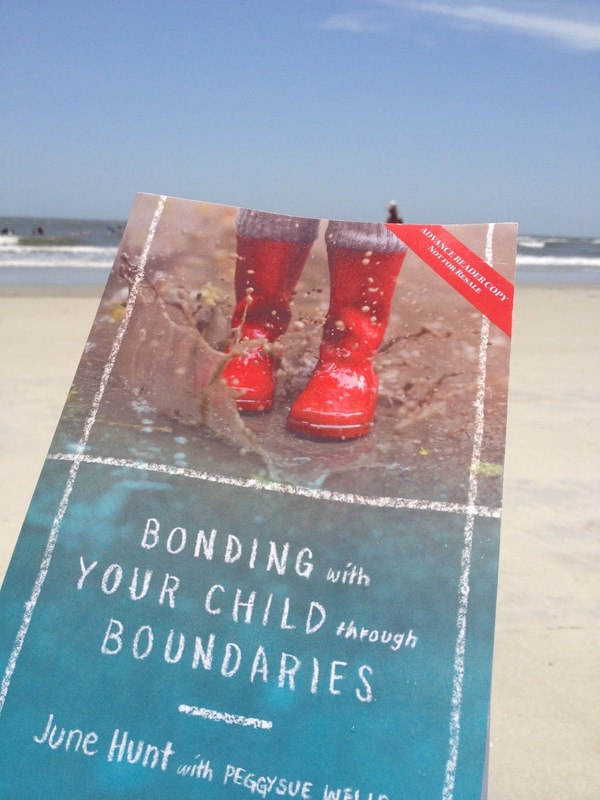 Hunt begins her book by explaining why boundaries are so valuable for our kids. It's not about protecting our homes, making our lives easier, or just establishing our authority. It goes much deeper than that. "External boundaries are designed to develop internal character," says Hunt. "Kids with character do the right things-not to impress the world but because they have been transformed from the inside out." Kids not only need boundaries, but they actually want them which is why they test where they are so often. It has been proven time and time again that kids with boundaries feel secure as opposed to kids who are left without them. After establishing the importance of boundaries, I love the practical tips and ideas for maintaining the boundaries once they are set. Not just focusing on discipline, Hunt stresses the equal importance of rewarding good behavior. This is something that I tend to forget over time. It is just as important to positively reward a child for staying within his/her boundaries as it is to negatively reward a child who is testing the boundaries or stepping outside of them. She gives some great "reward system" examples to test with your child which I loved! The second section of this book dealt with almost every specific parenting issue you can think of, including but not limited to balk talking, car etiquette, cheating, chores, bedtime, cliques, school behavior, tattling, lying, bad habits, peer pressure, sibling rivalry, stealing, whining and more! Hunt includes practical conversations to have with your child about each of these issues as well as offers wisdom from God's word, and getting to the heart of the matter! I found this book to be extremely encouraging and challenging as a mother and I know that others will too! I would love to hear from the other mothers out there seeking to raise children with more than just good behavior, but godly character! What do you feel is the most important area to set boundaries in for your children? Leave me a comment below as an extra entry into the giveaway and then fill out the Rafflecopter form below! I think the number one boundary that should be set with young children is - when you tell them to do something, follow through and be sure they do it. Establishing your authority early, helps pave the road for what is ahead. So many children today ignore their parents' requests and to me that is a show of disrespect. Let your words be spoken firm but loving when wanting your child to obey. 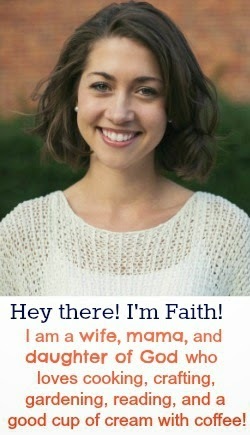 I am right there with you ! This looks like a wonderful book. Discipline is hard, but it is worth it to shape our children's hearts. I think that the number one boundary should be to have respect for others. I think that if you can teach respect and manners to a kiddo it will take care of a lot of the other boundaries on its own.